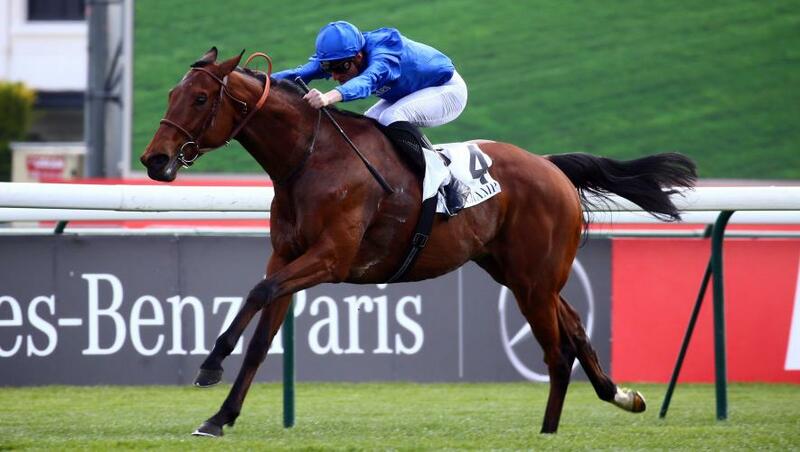 Persian King made all to capture the mile G3 Prix de Fontainebleau in great style on his return to action at Longchamp, France, on Sunday, 14 April. His emphatic victory in this Guineas’ trial bodes well for the future, but there was no immediate news on whether he will go for the French Guineas (1m, the Emirates Poule d'Essai des Poulains, Longchamp, 12 May), or the English Guineas (1m, Newmarket, 4 May), with the decision being decided on how the three-year-old Kingman colt comes out the race, the results of other trials and discussions between the owners and trainer Andre Fabre. Persian King, the highest-rated two-year-old trained in France last year, finished second on debut, but is unbeaten in four starts since then. He broke well from the stalls today under Pierre-Charles Boudot and took the five-strong field along at a good pace and lengthened well in the straight to go clear of rivals. Persian King beat stable companion Epic Hero (Mickael Barzalona), who raced in third on the inside before improving to second and then being one-paced, by five lengths in 1m 36.41s on good ground. Lisa-Jane Graffard of Godolphin said: “Persian King was impressive. “It was great to see him back on a racecourse showing top-class form again. “Pierre-Charles said that Persian King gave a very good feeling. “We will see how the colt comes out of the race, what happens in the other trials and then discuss where to race next. “He has just won a Guineas trial very well so the next step is to run in a Classic, but the question to be answered in time is which one.